This short adventure into the Caucasus region of Central Asia discovers one of the fascinating states of the former USSR. We combine sightseeing of cultural towns and cities, walks in stunning countryside along with exploration of fascinating historical sites. Experience Georgian hospitality eating delicious traditional home-cooked food with local families, toasted with plenty of wine - the Georgian way! Arrive in Tbilisi and transfer to the hotel. Passengers travelling on the group flight from London are not scheduled to arrive until the very early hours of the tomorrow morning. After a leisurely breakfast we head out on foot to explore both the Old and New Towns of Georgia's cosmopolitan capital city. We start our visit in the old part at the Church of Metekhi, before continuing through narrow lanes past cafes and restaurants to the Synagogue, Sioni Cathedral and Anchiskhati Church - which marks the end of the Old Town. We continue on to the fascinating Georgian National museum of History, before taking a stroll along Rustaveli Avenue, where we can admire the architecture of many grand buildings that line Tbilisi's main street. This afternoon we take the cable car to Narikala Fort, which dominates the skyline of the Old Town, from there we walk down to the brick-domed Sulphur baths. 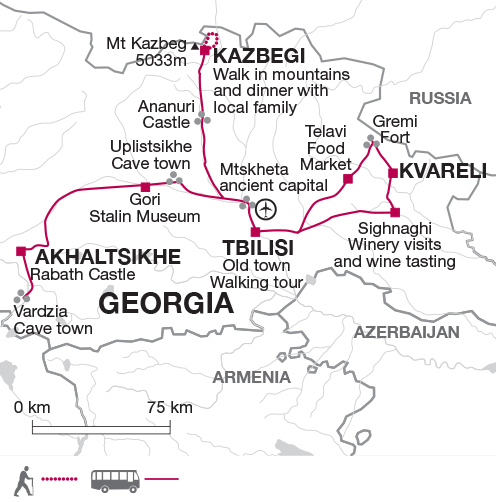 This morning we leave Tbilisi as we head east to Kakheti, Georgia's wine region. We drive through stunning countryside with mountain views. Our first stop is at the tiny fortified town Sighnaghi, known locally as the Paris of Georgia! Here we visit a local winery and have the opportunity to sample the vintage. From here we continue on to a farmer's house for some home-made wine-tasting and where we see how traditional Georgian sweets 'Churchkhela' are made. Our included lunch is with a local family who first show us how Georgian bread 'Shoti' is baked before serving us some freshly baked bread with our delicious home-made lunch. Alongside other dishes we will have a Georgian favourite 'Mtsvadi' (Shashlik) - a meat barbequed on a fire of vine branches. Our lunch is washed down with Kakhetian red and white wines and 'Chacha' the Georgian firewater. Our feast will be led by the local toast master - 'Tamada', a Georgian tradition. This afternoon we pay a visit to the imposing Gremi Fortress. Gremi was once the mighty capital of Kakheti province in the 16th and 17th centuries, serving as a trading town on the Silk Road. Afterwards we have the option to visit a local winery on our quest to discover everything there is to know about Georgian wine. We spend the night at a guesthouse in Telavi, a small city in the foothills of the Tsiv-Gombori mountain range. This morning we visit the UNESCO Alaverdi Cathedral, an 11th century Georgian Orthodox monastery. Once Georgia's highest at around 50 m, it dominates the surrounding countryside; however it was superseded in 2004 by Sameba, Tbilisi's Holy Trinity Cathedral, which stands at a magnificent 100 m! Nearby Alaverdi we visit a local master craftsman who will show us how 'Qvevri' are made. Qvevri are large earthenware vessels that are buried underground to allow for the fermentation of grapes as part of the traditional Georgian wine making method. We return to Telavi where we have time for lunch. Here we also visit a food market where stalls are loaded with fresh fruit and vegetables, meat and fish, spices and drinks. And we would not be able to leave the wine region behind without the chance of a final tipple! We head to the Tsinandali Duke's heritage to take a tour of the museum and enjoy a glass of wine afterwards. Driving over Gombori Pass we enjoy the views of rolling hills as we return to Tbilisi for the night. Leaving the capital again this morning, we drive to picturesque Mtskheta, the spiritual heart of Georgia. Here we visit the hilltop 6th century Jvari Monastery, from where we have spectacular views of Mtskheta and the confluence of two rivers below. We make our way down into the town where we visit Svetitskhoveli Cathedral. The 9th century basilica contains the grave of Sidonia, who was said to have been buried holding Christ's robe. We continue through villages to the Silk Road cave town of Uplistsikhe. Here an entire town of streets, churches, palaces and residential buildings has been carved into the mountainside. Dating from the first millennium BC, it gradually grew to be an important city on the trade route linking Byzantium with India and China. After exploring this unusual place we drive on to Akhaltsikhe for a two night stay at a guesthouse. Our destination today is one of Georgia's most significant sites, the cave town of Vardzia. Bigger and more dramatic than Uplitsikhe, Vardia is cut into a towering cliff and is in remote location reached by a drive through a beautiful rolling landscape. Established by King Giorgi III in the 12th century as a stronghold against the Turkish Sultanate (the Turkish border is only 10km away). Vardzia was subsequently developed by his daughter, Tamar (later to become Queen Tamar), who created a cave monastery that became a centre of Georgian culture. This network of caves above the Mtkvari (Kura) river once numbered 3000, with up to 19 tiers in some places. Much of it was destroyed after a huge earthquake in 1456 and only 550 caves have been since discovered. There are numerous churches, meeting halls, refectories and wine cellars, all interconnected by tunnels and stairways. We have time to explore and navigate our way around this fascinating place before returning to Akhaltsikhe and time permitting we may visit Rabath Castle. Today is mainly spent on the road as we head north to the mountains. We stop at the Soviet style town of Gori, where Georgia's most famous son, Stalin, was born. Here there is time to visit the Stalin museum, if you wish, and learn much about his life. Interestingly he initially began training as a priest in the Georgian Seminary, before abandoning religion to become a brigand and join the new Bolshevik movement. It has been suggested too that Georgia escaped the worst horrors of Stalin's regime because he was afraid of his conservative Christian mother! Those who prefer to explore the town have time to observe a little of local life. Further into our journey we pay a visit to Ananuri Fortress overlooking a reservoir on the Aragvi River. As we head further north the scenery becomes more dramatic as we ascend along the Georgian Military Highway. We drive through the spectacular and breathtaking mountain scenery of the Greater Caucasus as we make our way to through Gudauri (2196 m), a winter ski resort overlooking an epic gorge and on to the mountain village of Kazbegi. This evening we enjoy the hospitality of a local family for dinner. We can enjoy more of the local firewater as well as the fresh mountain air. This morning we walk from Kazbegi through Gergeti village and up to the Gergeti Holy Trinity church, stunningly located on a hilltop both overshadowed and overlooking the surrounding snowy peaks of the Greater Caucasus Mountains. The walk is a round trip of 3-4 hours. The area is a treasure trove of mythology - it was to the majestic Mount Kazbegi (5047 m), the highest peak in this region, that Prometheus was chained. This part of the Caucasus is a protected area, and is home to a variety of flora and fauna. Georgia has over 100 different mammals, and although the European bison and Caucasian leopard have become extinct, there are still wolves and bears in the mountains. This afternoon we drive back to Tbilisi for our final night - we have the option of taking our farewell dinner at a local restaurant which features a folk dance show, no doubt with more Georgian wine and 'Chacha' to toast our adventure. Georgia has a temperate climate with warm dry periods from June to September. Early and late in the season, temperatures can drop to sub-zero at higher altitude. Weather is changeable in the north and mountains; it can be cool especially at night, bring a warmer jacket. Raingear is essential at all times. In remote parts of Georgia you should avoid shorts and vest tops; long trousers or skirts are ideal. A headscarf is essential for visiting churches and mosques. Comfortable shoes for visiting sites and hilly towns; sandals; lightweight walking/trail boots for day walks. If you are planning on taking any prescription medications with you on tour it is recommended that you also carry a prescription issued by your doctor. A waterbottle, torch, swimsuit, sunhat, suncream and sunglasses. Although entirely voluntary, tipping is a recognised part of life in this region of the world. Some local staff will look to members of the group for personal recognition of particular services provided. Accordingly, you should allow US$ 20. In order to make things easier for you, the Tour Leaders may organise a group's tips kitty and if this is the case, they will account for it throughout the tour. Georgia: Visas are not required for EU nationals, UK, Canadian or US citizens. Other nationalities should consult the relevant consulate. This short tour has been carefully planned to introduce you to the many highlights of Georgia. While all roads lead in and out of the Tbilisi, you will experience the diverse scenery on offer in this small country, not to mention the hospitality of the locals, the delicious food and the kick of the local tipple, which is generously shared!